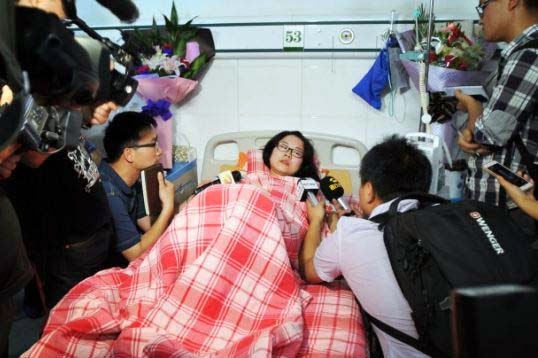 The Daily Mail has been running a fake story claiming that a pregnant Changsha nurse had 'lost her baby' after being attacked by relatives of a cancer patient who died. Chinese media reported the attack but said she was fortunate to have avoided a miscarriage. A doctor at a Guangzhou hospital could only spend an average of one and a half minutes per patient when he was the only clinician on duty and had a waiting room of 100 patients to see in one morning. About 20% of dogs and 6% of cats in Guangzhou are infected with hepatitis E, a new study has shown. The high rates of hepatitis infection should raise concern about the eating of dogs, warn researchers from the South China Agricultural University. China should not copy the US private model of healthcare according to Nobel prize winning economist Daniel McFadden, of the University of Southern California. Professor McFadden said that when looking at healthcare systems around the world, the most efficient are those where the community medical providers are either employed by the government or employed by companies that are largely contracting to the government and not operating as private businesses. One in ten emergency department patients leave without being seen by a doctor, according to a study carried out in Chengdu hospitals. Those who left tended to be families who arrived on foot with children who had less serious problems. Most Chinese people with atrial fibrillation go untreated, with only 40% receiving anticoagulants, according to a study from Fuwai Hospital and Peking Union Medical College, Beijing.The study also showed that only 26% of people treated for atrial fibrillation received adequate treatment. Reform of the medical school curriculum is needed in China as many medical schools are still using outdated and ineffective teaching methods that fail to keep pace with developments in medicine, according to a study from Tongji University, Shanghai. Iron deficiency anaemia is common in rural parts of central China, where only about 40% of infants have an adequate diet, a study by the UNICEF Office for China, Beijing, shows. Malnutrition and anaemia was more of a risk for ethnic minorities and for those living in poor mountainous areas.